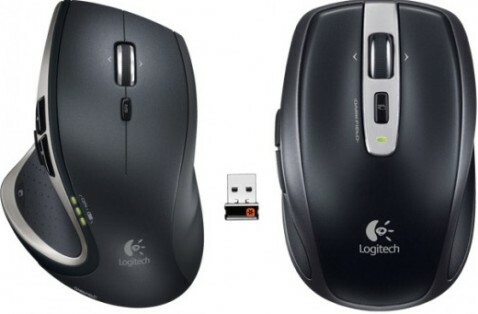 The world’s leading provider of personal peripherals & accessories, Logitech has announced the release of a pair of new high-performance laser mouse – Logitech Performance Mouse MX (full-size mouse with flexible micro-USB charging system and 4 customizable thumb buttons) and Logitech Anywhere Mouse MX (more compact, notebook mouse). Both mice feature hyper-fast scrolling, advanced 2.4GHz wireless, and latest Logitech Darkfield Laser Tracking technology that provides users an accurate, precise cursor control on virtually any surface, including clear glass (> 4mm thick) and high-gloss surfaces. According to Logitech, Darkfield Laser Tracking technology detects microscopic particles and micro-scratches on the surfaces (rather than tracking the surface itself), thanks to its dark field microscopy. The new Logitech Performance Mouse MX and Logitech Anywhere Mouse MX that include tiny Logitech Unifying receiver will ship in U.S. and Europe starting later this month for around $100 and $80, respectively.